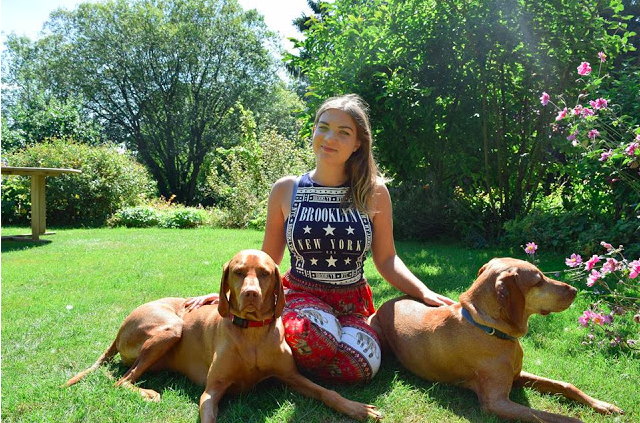 House sitting is the best way to travel the world luxuriously and cheaply: by looking after homeowners' pets and houses you can travel the world rent-free. That's what we did for three years straight, and the reason we started this house sitting travel blog. We are known as the house sitting experts and we want to help you out, one of the many ways we can do that is by giving you a Trusted House Sitters Discount Code. Why Choose Trusted House Sitters? There are lots of house sitting websites out there, but in our opinion Trusted House Sitters is the most superior one. In the beginning, we signed up for lots of different house sitting websites, but Trusted House Sitters is the only one we ever had any success with. And what success! Through Trusted House Sitters we found over 30 house sits across 3 different continents, giving us 3 years of free accommodation. And the majority of the houses we sat through them have been luxury house sits. 3. Choose between Owner (if you're looking for house sitters) or Sitter (if you're looking to become a house sitter). OR choose a combined membership at the checkout. 4. Follow the clear instructions to sign up. 5. 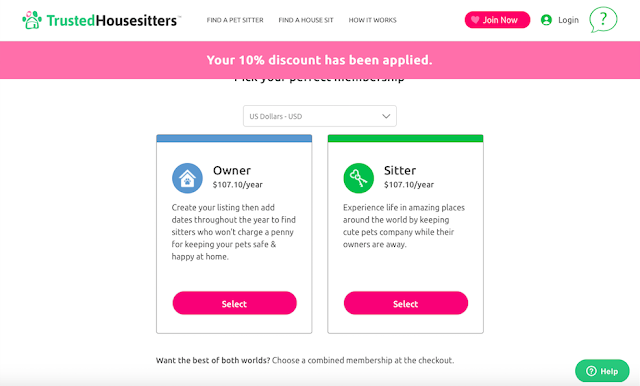 At the checkout, your 10% Trusted House Sitters discount code will have been automatically applied. The Trusted House Sitters Cost for both homeowners and house sitters is currently $107.10/year. Currently, there is no Trusted House Sitters Free Trial, however, you can browse house sitting opportunities to see if there's something that would be suitable for you. With thousands of house sits out there, we know you'll find your dream house sit. Although there is no Trusted House Sitters Free Trial, we can offer you a 10% discount code. Is Trusted House Sitters Worth it? $107.10/year (or rather, $96.39/year with your discount code), might seem like a lot upfront, so is Trusted House Sitters worth it? Firstly, think for a minute how much you pay on rent or your mortgage, and how much you pay on bills (electricity, gas, water, wifi) per month. Make a rough estimate of how much it is a year. Even if you've paid off your mortgage I bet your bills are higher than $96.39/year. Am I right? House sitting is by far the cheapest way to live. And as for travelling, you could easily spend $96.39 a NIGHT in some countries, and even in the cheapest of countries in the grottiest of hostels, it's not going to last you much longer than a few weeks. Put simply, even with the signup fee, house sitting is by far the cheapest way to travel. But that's all very well and good but what if you sign up and don't get a house sit? That's just $96.39 down the drain. I'm not going to lie and say that you sign up and automatically get house sits, in some ways, house sitting is like a job - in that you have to be professional and apply in the right manner. Once you've got your sit, you still have to be professional about it (respect the house and pets), but essentially you are living as you usually would (with your own routine, just slightly edited to fit the pets in). 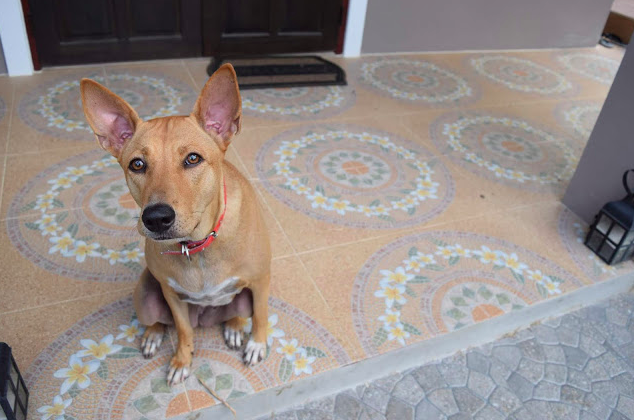 Check out this useful post on how to become a house sitter. House sitting gives you free accommodation in exchange for looking after the pets. But when it comes to other costs, this depends on each house sit. Some house sits (especially in countries like Costa Rica) will ask for a contribution to the bills. Personally, we don't do these house sits as the cost of the homeowners covering the bills is way cheaper than them paying for pet care (not to mention, the pets are a million times happier at home than in a pet home, and that's something you can't put a price on). Some homeowners are happy to leave the car for you to use, others aren't. It depends on the house sit. Personally, if a car has to be used for the pets (e.g. to take the pet to a favourite park, or to take them to a vet in an emergency), we think it's only fair that the homeowner lends us their car. Bear in mind, many car hire companies are not happy having pets in their cars. As for car insurance, this varies from country to country (and hence why some homeowners aren't keen to lend you theirs). In Australia, it's the car itself that gets insured, whereas in the UK it's the person. Whatever happens, make sure car insurance is covered by you or by them - it's an absolute must. Most homeowners will happily pick you up from a local airport, train station or bus station (just like they would if you were a family or friend that was visiting). The cost of getting to the house sit is up to you though, so think carefully about whether you can afford flights/train tickets before you apply. We always check on kiwi (skypicker) before applying to a house sit, because it's by far the best flight comparison website out there. Food isn't expected by house sitters but it is often given by homeowners - often to a very generous extent which is great. Just be clear about what can and can't be eaten - some homeowners ask you to replace anything you have eaten, others are happy for you to have the odd bit of flour or rice, others will deck out their storage cupboards and fridge for you and insist you eat everything, it depends on the sit. Check out my house sitting or airbnb post to see if airbnb is suitable for you and for an airbnb coupon code.